This exhibition ran from 19 August to 4 December 2016. 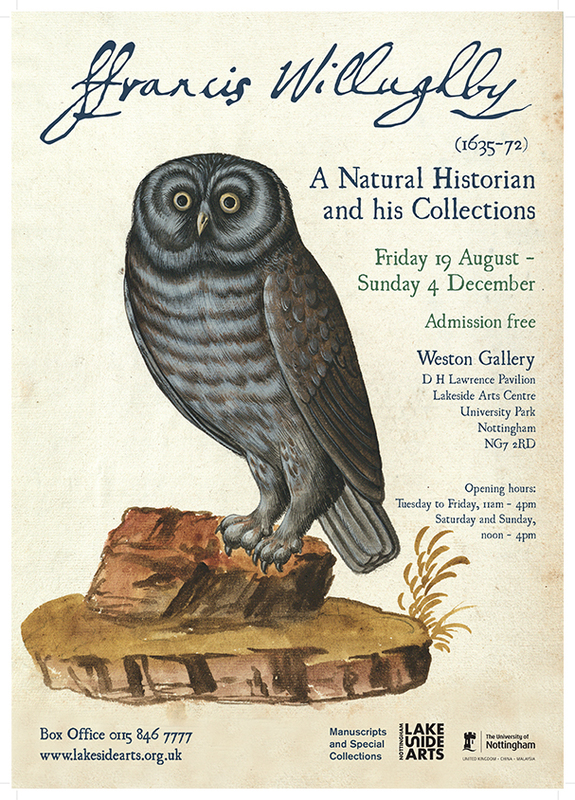 This exhibition drew on papers preserved in the Middleton Collection, the family archive of the Willoughby's of Wollaton Hall, now held by The University of Nottingham. In the history of science the 17th century was a period of exciting change. While England was enduring political and religious turmoil, reaching a climax in civil war and the execution of Charles 1, a spirit of speculative enquiry encouraged the testing of traditional knowledge. Francis Willughby, whose estates in the Midlands supported an independent life of travel and study, was an original member of the Royal Society. His influential work on birds and fishes was published after his death by the naturalist John Ray (1627-1705), but the scope of Willughby's other studies remained largely unknown. Informed by recent research, the display revealed the extent of Willughby's collaboration with Ray. It shed new light on the range of his interests, illustrated by images of birds, fishes and plants which were collected in England, Wales and on the Continent to support his studies. Click on the poster to open a larger version of the poster in a new window. Fascinating exhibition. Interesting to hear about such a learned multi-disciplinary member of the Willughby family. Superb; erudite; scholarly; fascinating; beautifully curated.